Interest rates have gone up for those seeking loans. Bank profits are up because interest rates have not gone up as much for depositors. Please consider Big Banks Lean on Main Street for Profit Before Fed's Pause Hits. The Fed’s four interest-rate increases last year and a relatively buoyant U.S. economy have boosted what banks can charge for loans, with the average rate the firms earned rising almost 0.5 percentage points in the past year. They’ve also so far been able to limit how much of the hikes they’ve passed on to depositors. At Bank of America, the consumer unit’s net interest income climbed 10 percent, helping propel the bank to record quarterly earnings. Bank of America said net interest income growth will slow over the rest of this year, while Wells Fargo & Co. went even further and predicted a decline. 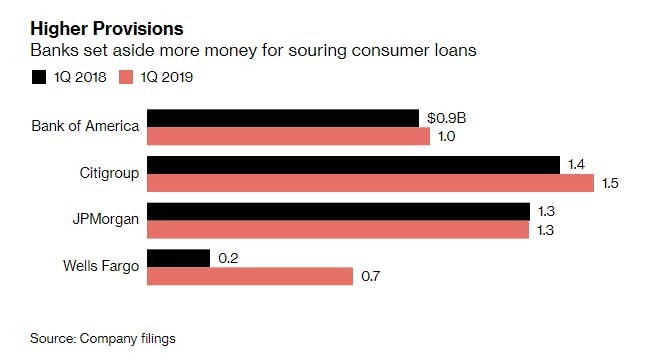 And three of the four largest lenders increased provisions to cover consumer loan losses, with Wells Fargo more than tripling the amount it set aside. For now, the Fed’s March reversal and a flat -- and at times inverted -- yield curve is the more pressing concern. Wells Fargo said net interest income could fall as much as 5 percent this year, while Bank of America sees it growing at half of 2018’s pace. Still, JPMorgan, which stuck with its outlook for net interest income to climb to more than $58 billion in 2019, sees a silver lining in the Fed’s pause: less pressure to raise rates for its $1.5 trillion deposit base. Banks always say they are prepared for recession but history shows they aren't as soon as recession hits. That said, US banks are far better prepared than their European counterparts. The ECB made a huge mistake with negative interest rates whereas the Fed bailed out US banks slowly over time by paying interest on excess reserves. Negative interest rates (charging banks instead or paying them) harmed already crippled European banks. This material is based upon information that Sitka Pacific Capital Management considers reliable and endeavors to keep current, Sitka Pacific Capital Management does not assure that this material is accurate, current or complete, and it should not be relied upon as such.